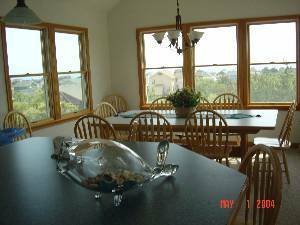 Beautiful house centrally located in Duck, easy walking distance to shopping and to the beach. 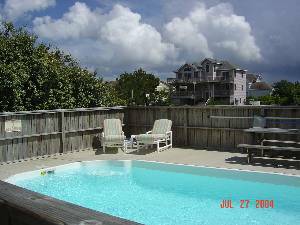 Your family will enjoy lounging by the Private pool or warming up in the Hot Tub. Free high speed internet access via cable modem. Computer not provided. Bring your laptop or PC. Heated pool available at an additional charge. 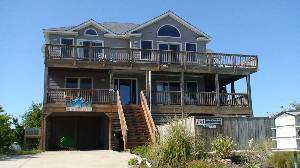 The living room, kitchen, dining room and decks offer spectacular ocean views. 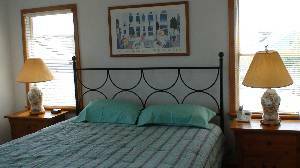 Level 1 has 1 Bd with Q and one with a twin bed and a full futon. Level 1 includes a handicap friendly bath and shower. It also has a pool table and an extra refrigerator. 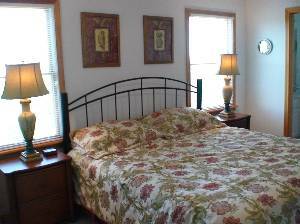 Level 2 has two master BRs/bath with King beds, the bunk room, and a queen room which share a hall bath. Level 3 has a master suite/bath with jacuzzi, a spacious living room, kitchen and dining room. Amenities include: 9 CATVs (one in each bedroom, 1 in the game room and a 52" big screen TV in the great room), 1 dvd/vcr combo, 3 VCRs and a video library, 1 DVD, 1 Sony Playstation w/controller (you bring extra controller and games), 2 refrigerators, 2 dishwashers, washer/dryer, stereo with CD, high chair, pack n play, water filter in kitchen. Children 2 and under are not counted in the limit of 14. Wright Brothers memorial in Kitty Hawk. Small plane tours and hang-gliding available. NC Aquarium and Elizabeth Gardens in Ronoake. Lost Colony re-enactment theatre available. Located well back from the road, you get a feeling of privacy in this house. The view from the decks are spectacular. The pool opens early this year in March! Inviting pool is fenced and private, includes lounge chairs. The kitchen bar seats 4, the dining room table seats 12. Great place for a family dinner. 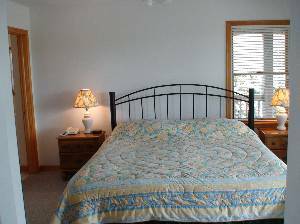 This master king bedroom has a large bathroom attached with a jacuzzi tub and a shower. Windows everywhere! This master king bedroom is on the second floor with views to the back. 2 Master on 2nd fl. One of 3 king bedrooms- walk out to deck and hot tub. 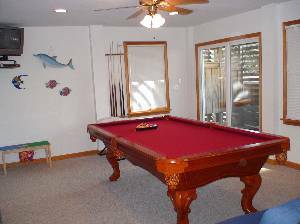 The game room has a pool table and a TV. 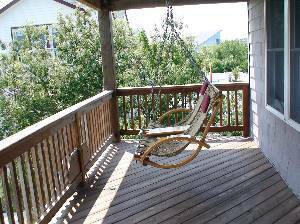 Enjoy the gentle ocean breezes or watching the stars at night in the comfortable swing. Deposit: Security/cleaning/damage deposit- none required, rental price includes a limited damage waiver policy. Fifty percent of the rental is due upon confirmation. Cancellations and Refunds: If unit is not re-rented you will forfeit all money prepaid. Other Fees: 7% sales tax, $100 charge for dogs (plus tax), No charge to use credit card!